An Ikea Restaurant is located in both Ikea stores in the Vancouver area: Richmond (map, 3200 Sweden Way, Richmond, British Columbia, phone: 604-273-2051) and Coquitlam (map, 1000 Lougheed Highway, Coquitlam, British Columbia, phone: 604-636-1000). IKEA is famous for the clean and modern design of their reasonably priced home furnishings and accessories. Their stores are “family friendly” which means there is a room filled with balls for kids to play in (one of my favorite places to go when I was a kid), and a bunch of kid-friendly items such as hotdogs and meatballs on the menu at their restaurant. 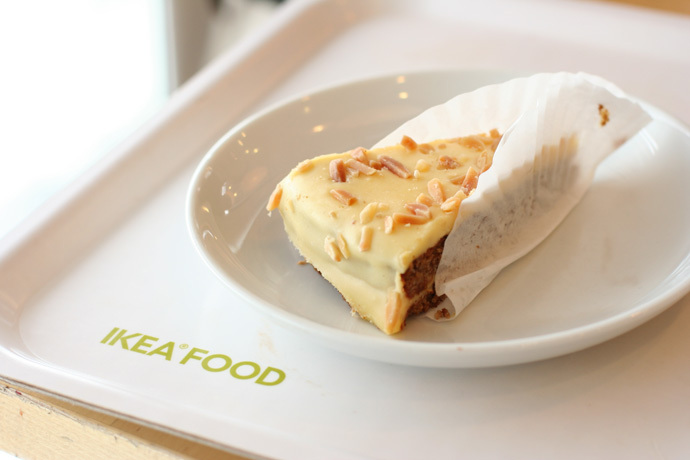 I went on a visit to Ikea on a Sunday afternoon, mainly to try their restaurant. The food at the restaurant is fairly inexpensive, because they know if people feel comforted by good food, they might be more inclined to spend hundreds of dollars on that new couch, table, or desk. It sure worked for me – I really only intended to visit the restaurant and then have a quick look around the store, and I ended up spending over $300 on various items. Yikes! 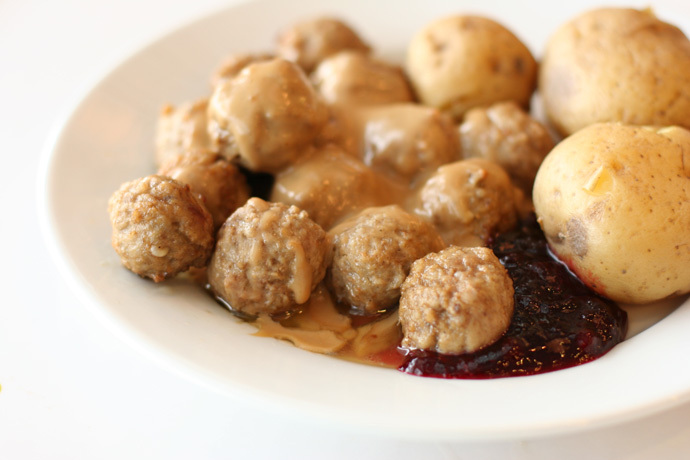 Being a Swedish company, Ikea features some Swedish items on their menu including the meatballs (pictured below) which cost around $7 for 15 meatballs with potatoes or fries (or $6.49 for 10 meatballs, potatoes, fries, and a soft drink). 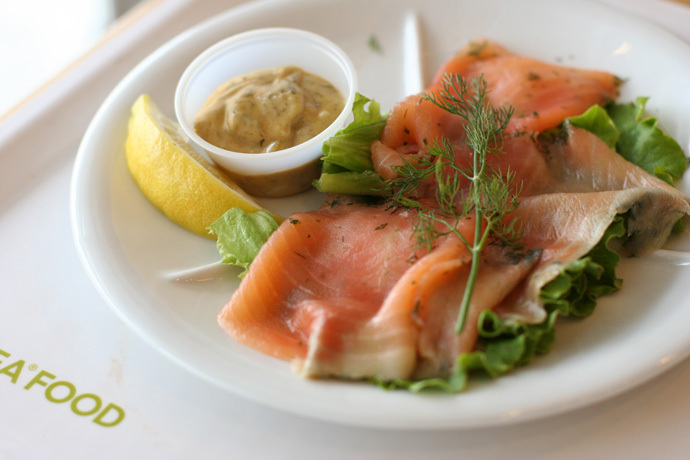 They also have some really tasty cold smoked salmon dishes such as the Gravlax with mustard and dill (also pictured below, around $5.00). For dessert they offer some nice pastries and cakes, such as the one pictured below (around $2.00). If you like pasta, you can get a plate of Organic Pasta for $1.99. Their menu describes this dish as, “organic pasta with organic vegetarian tomato sauce” and says the pasta is available after 11am. But if you go before 11am you can get a $1.00 (yes, that’s one dollar) breakfast of scrambled eggs, sausages, and home fries. Their hope is that you’ll spend much more on the home furnishings and accessories. After all, you are already there, so why not pick up a TV stand, lamp, and chaise lounge or two? Ikea Swedish Meatballs from Ikea in Coquitlam (a suburb of Vancouver BC Canada). Around $7.00. Ikea Swedish Gravlax with Mustard and Dill (smoked salmon, delicious!). Around $5.00. From Ikea in Coquitlam BC Canada, a suburb of Vancouver. Swedish Dessert pastry from Ikea restaurant in Coquitlam BC Canada (a suburb of Vancouver). Around $2.00. Pacific Centre Mall in Vancouver (map, web site, 700 W Georgia St Vancouver, BC, Canada, phone 604-688-7236) is an upscale shopping destination in Vancouver’s trendy downtown core. Close to the Vancouver Cruise Ship Terminals (Canada Place), the business district, Vancouver Art Gallery, and a short walk from Robson Street, Pacific Centre is a place to browse the latest fashions and then indulge in some good eats at the food court. The mall closes at 9pm most weekdays, and if you head down to the food court at around 7:30pm or 8pm you can fill up on some really cheap food, such as the “buy one get one free sushi” (pictured below) or a heaping plate of Chinese fast food for $5. The sushi pictured in the video below was $10 for everything, including all-you-can-drink Miso Soup. The food court has sleek, modern decor with cool lighting and funky chairs. 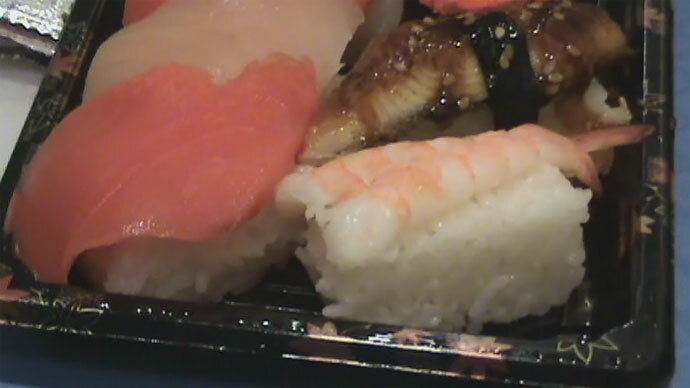 Ebi (shrimp) sushi, salmon, tuna, and unagi (BBQ eel) from Pacific Centre mall food court. 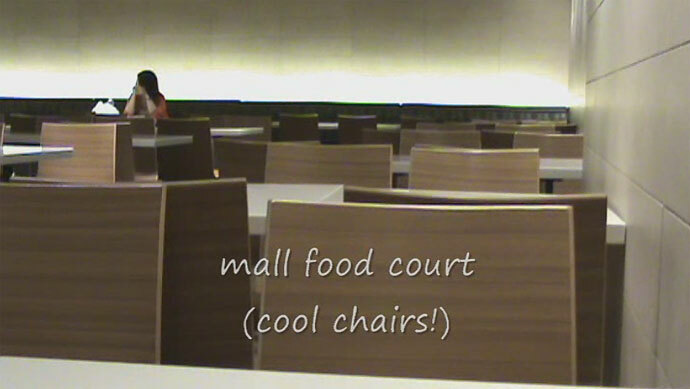 The food court has sleek, modern decor with cool lighting and neat chairs. 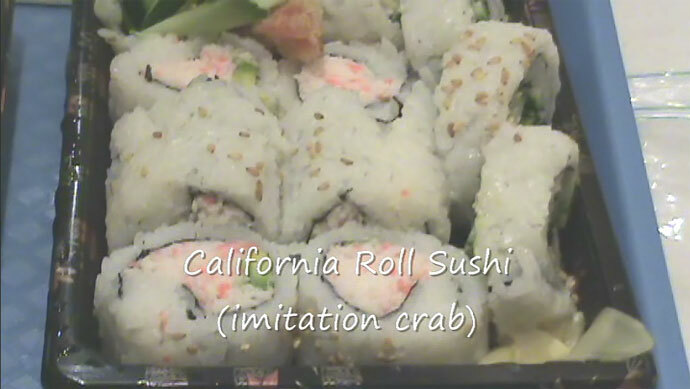 California Roll from Pacific Centre food court in Vancouver, BC, Canada. I made a visit to the Vancouver Flea Market (web site, map, 703 Terminal Ave. Vancouver, BC, Canada, phone: 604.685.0666) and tried their cafeteria. The Vancouver Flea Market is a thriving environment where all kinds of dealers and sellers propose their treasures. Here you will find all kinds of things from collectibles and memorabilia to everyday household items as well all the things you thought you didn’t need! The market is a 5 – 10 minute walk from the Main Street Skytrain station. Admission to the market is only 75 cents, and that lets you into the main showroom where you can browse all the tables of endless cool stuff (I picked up a piece of fools gold crystal for $8), and into their busy cafeteria which serves filling, hot American-style food at very low prices. 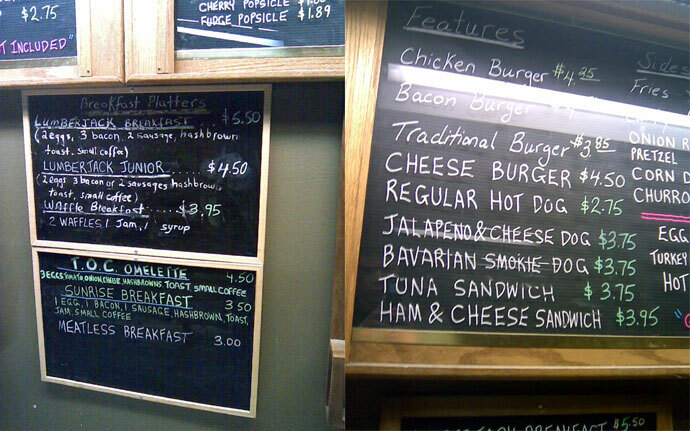 Speaking of the food, we tried the Traditional Burger (an amazing deal at $3.85, shown in video below) and the T.O.C. Omelette ($4.50, also shown in video below), which was a 3-egg omelette with tomato, onions, cheese, toast, and a small coffee. I opted to get an apple juice instead of the coffee and it only added about 40 cents to the price. The food is quite similar to Denny’s restaurant but is cheaper, and the atmosphere is not as fancy as Denny’s. I made a video of the dishes, which you can view by clicking here, or use the player below. I’ve also included a photo of the menu below. We hope you enjoy the great Cafeteria restaurants on Dine Out Here Vancouver.